The Providence quilt block is a good choice for a new quilter who is ready to move on to next quilt patch - the quarter square triangle. This block features four of these patches, as well as a number of half square triangles. All in all, it is a nice change from the usual blocks that are chosen in order for beginners to "get their feet wet". 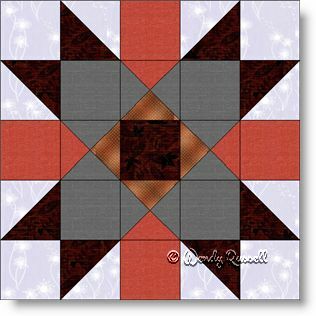 This five patch block is also a nice choice for learning about how colours and fabric textures can work together, as there are five different selections. An additional learning experience is that I have chosen to construct the block as an uneven nine patch, rather than sewing the patches together in five rows of five. The sample quilts illustrated both feature on point settings of the blocks, but as you can see, they look very different.